The Touch Assist is the most widely used and probably best known assist. It was first developed in the early 1950s and has been in use ever since. The application of Touch Assists is not limited to injuries. They are not just for the banged hand or the burned wrist. They can be done on a dull pain in the back, a constant earache, an infected boil, an upset stomach. In fact, the number of things this simple but powerful process can be applied to is unlimited! 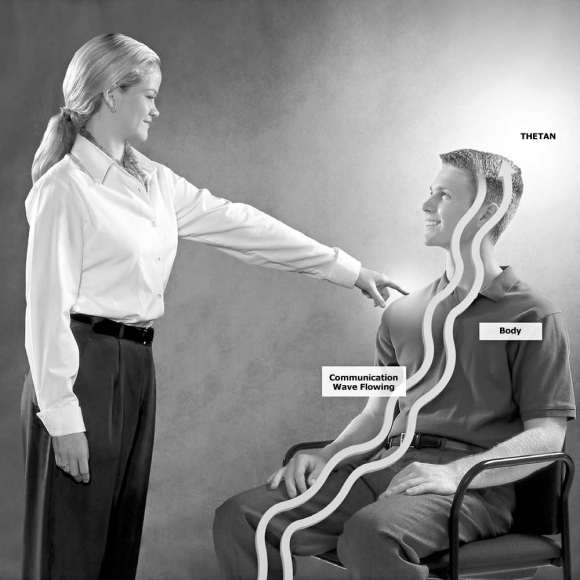 The purpose of a Touch Assist is to reestablish communication with injured or ill body parts. It brings the person’s attention to the injured or affected body areas. This is done by repetitively touching the ill or injured person’s body and putting him into communication with the injury. His communication with it brings about recovery. The technique is based on the principle that the way to heal anything or remedy anything is to put somebody into communication with it. Every single physical illness stems from a failure of the being to communicate with the thing or area that is ill. Prolongation of a chronic injury occurs in the absence of physical communication with the affected area or with the location of the spot of injury in the physical universe. When attention is withdrawn from injured or ill body areas, so are circulation, nerve flows and energy. This limits nutrition to the area and prevents the drain of waste products. Some ancient healers attributed remarkable flows and qualities to the “laying on of hands.” Probably the workable element in this was simply heightening awareness of the affected area and restoring the physical communication factors. For example, if you do a Touch Assist on somebody who has a sprained wrist, you are putting him back into communication with that wrist as completely as possible. In addition to control and direction of the person’s attention, a Touch Assist also handles the factors of location and time. 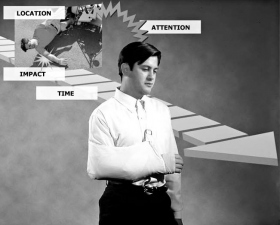 If a person has been injured, his attention avoids the injured or affected part but at the same time is stuck in it. He is also avoiding the location of the injury, and the person himself and the injured body part are stuck in the time of the impact. A Touch Assist permits healing to occur by restoring the person to the present and his whereabouts to some degree. A Touch Assist helps handle the factors of time and location when a person has been injured. Part of his attention is stuck in the past moment and place of the impact. The assist restores the person to the present and thus permits healing to occur. 0. Administer any first aid that may be needed before you begin the assist. For example, if the person has a bleeding wound it should be dressed as the first action. 1. Have the person sit down or lie down—whatever position will be more comfortable for him. 2. Tell him that you are going to be doing a Touch Assist and explain briefly the procedure. Tell the person that he should let you know when he has done the command. 3. Give the command “Feel my finger," then touch a point, using moderate finger pressure. Do not touch and then give the command; that would be backwards. Touch with only one finger. If you used two fingers the person could be confused about which he was supposed to feel. 4. Acknowledge the person by saying “Thank you” or “Okay” or “Good,” etc. 5. Continue giving the command, touching and acknowledging when the person has indicated he has done the command. When doing a Touch Assist on a particular injured or affected area, you approach the area on a gradient and recede from it on a gradient. You approach the injury or affected area, go away from it, approach it, go away from it, approach it closer, go away from it further, approach to a point where you are actually touching the injured or affected part and go away further. You try to follow the nerve channels of the body, which include the spine, the limbs and the various relay points like the elbows, the wrists, the back sides of the knees and the fingertips. These are the points you head for. These are all points in which the shock wave can get locked up. What you are trying to do is get a communication wave flowing again through the body, because the shock of injury stopped it. No matter what part of the body is being helped, the areas touched should include the extremities (hands and feet) and the spine. The touching must be balanced to both left and right sides of the body. When you have touched the person’s right big toe, you next touch the left big toe; when you have touched a point a few inches to one side of the person’s spine, you next touch the spot the same distance from the spine on the opposite side. This is important because the brain and the body’s communication system interlock. You can find that a pain in the left hand runs out (dissipates) when you touch the right hand, because the right hand has got it locked up. In addition to handling the left and right sides of the body, the body’s back and front sides must also be addressed. 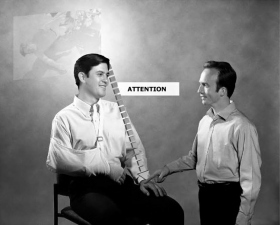 In other words, if attention has been given to the front of the body, attention must also be given to the back. The same principle applies in handling a particular body part. For instance, you might be handling an injury on the front of the right leg. Your Touch Assist would include the front of the right leg, the front of the left leg, the back of the right leg and the back of the left leg, in addition to the usual actions of handling the extremities and spine. 6. Continue the assist until the person feels better. You will notice an improvement in the person from what he says or how he looks. These are called indicators. Indicators are conditions or circumstances arising during an assist which indicate whether it is running well or badly. When a bad condition, such as an injured hand, improves, that is a good indicator. If the pain in his hand lessened, that would be a good indicator. A Touch Assist is continued until the person being helped has good indicators, meaning he feels better, the pain has diminished, he is happier about it, etc. He will also have a cognition. You may have to give Touch Assists day after day to achieve a result. On first doing a Touch Assist you might only get a small improvement. Giving another Touch Assist on the following day, you could expect a bit more improvement. Next day you may get a somatic blowing off completely. It might take many more days than this, with a Touch Assist given each day, before such a result is achieved; the point is that the number of Touch Assists you can do on the same thing is unlimited. Communication with the body lessens when one is ill or injured. A Touch Assist helps restore a person's ability to communicate fully with an ill or injured body part. Tell the person, "Feel my finger," and touch a spot on his body. Acknowledge him when he does so. Follow the nerve channels of the body. The touching must be balanced to both sides of the body. A Touch Assist must include the extremities and the spine. A correctly done Touch Assist can speed the thetan's ability to heal or repair a condition with his body. Never do a Touch Assist as the first action on an injured person when you can do a Contact Assist. If the exact location where the injury occurred is available, do a Contact Assist. The Contact Assist can then be followed by a Touch Assist or any other assist action. Touch Assists can be used to good results on animals. In doing a Touch Assist on a sick or injured dog or cat, you should wear thick gloves, as they may snap and scratch. A Touch Assist can be done on a person who has been given painkillers or other drugs. This isn’t optimum but it is sometimes necessary under emergency conditions. Where a person has been injured, your objective should be to get to him and give him a Touch Assist before anyone gives him a painkiller. If the body has been very badly damaged, the person may still be in agony after your assist, but you will have gotten some of the shock off. At this point a medical doctor could administer a painkiller and repair the physical damage. Of course, if the person needs immediate treatment for excessive pain, you would not prevent it from being administered and would then deliver the Touch Assist when the person was more comfortable. Do not do a Touch Assist on a person who has a headache. Research has shown that headaches are often the result of mental phenomena that a Touch Assist would be the incorrect handling for. If a person has received an actual injury to the head such as being poked in the eye or hit on the head with a bat, he can be given a Touch Assist. The same applies to injuries to the teeth or painful dental work. The Touch Assist is easy to learn and can get quite remarkable results. It has the advantage of being easy to teach others. So use it well to help those around you, and teach them to help others in turn.